Kombucha Fuel: Kombucha Mushrooms Come in All Shapes, Sizes, and Colors! I have used the same SCOBY since May, so it was good to see that they stop being effective. I have several others, too. About a month ago, I decided to try continuous brewing, and it seems to be working pretty well, although I only have a 1-gallon container and a 2-gallon one was recommended. I took out one of the mushrooms today (it looks like it's the older one) and am considering slicing it up and sauteeing it with some veggies (if I get brave enough). If I eat it, I'll let you know if it's good. I'm glad my information was helpful & that the continuous brewing is working for you. 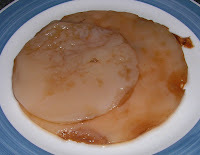 I just brewed my first batch of kombucha which produced a very robust, thick, creamy white, evenly colored SCOBY. Probably something to do with the consistently warm and dark spot where the jar is sitting. 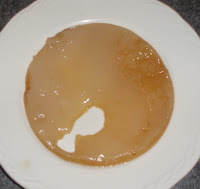 I decided to try eating some of the scoby. I peeled off several pieces and timidly put one in my mouth. It was sour/sweet, slimy, and VERY CHEWY. The sour-sweetness flavor is consistent throughout its thickness. It tasted kind of like a wet, super-chewy gummy bear. I offered a piece to the dog. He's a fairly picky eater, but he surprises me sometimes by liking things like blueberries, watermelon and roasted garlic. He didn't recoil at the offering, but he didn't choose to eat it. I decided to sauté some pieces. It was easier to tear the scoby than it was to cut with a knife, but my knife isn't very sharp. I heated some olive oil in a cast iron skillet. 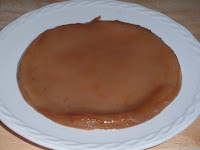 I squeezed excess moisture from the scoby pieces and placed them in the pan like little fish filets. They immideately started popping and hopping, like they were trying to get out of the pan! I let them brown and get a little crispy, then set them on a plate till cool enough to try. The texture was like fried calamari, but still sour-sweet. I sprinkled some tamari on the fried scoby pieces, and that helped the flavor. Now the dog was into eating the scoby. The oil made it tastier for him. 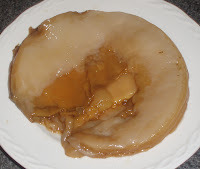 I will probably try this again, but I would like to know the nutritional value of kombucha SCOBY. Thanks for sharing, it sounds like you had an interesting experience! I hadn't thought of frying SCOBY pieces before! 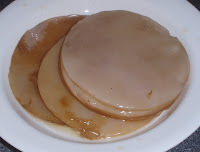 I actually did end up tasting a SCOBY too, and wrote about it here http://kombuchafuel.blogspot.com/2009/06/kombucha-gourmet-style-and-city-feed.html. I'm actually not too sure of the nutritional value of eating a kombucha SCOBY. This is Happy Herbalist's analysis of what's in a kombucha ferment http://happyherbalist.com/analysis_of_kombucha.htm (it's also important to remember that not all SCOBYs/ferments are exactly the same. They may have slightly different strains/proportions of strains of bacteria & yeast). I'd imagine that some of the nutrients/bacteria/yeast present in the kombucha ferment are also present in the SCOBY? On the page that I just linked to, it also says "Besides drinking kombucha tea, the anti-inflammatory property of the kombucha mushroom (SCOBY) itself has been studied and is often used in folk medicine applied directly to cuts, burns or abrasions." If I find out anything more, I'll write another follow-up comment and/or post it!